As many of you will be aware, Lush is now brimming with the Christmas items. Not being such an avvid lush fan last year, meant that i didn't indulge in the holiday items, but i have been waiting all year (i won't lie) for the new stuff to come in so i can try it out. I was starting to get bored of the normal range..i felt i'd tried most things, and needed an injection of newness. I'm going to review the items i've tried individually, mainly because i'm not one of those people that tries to use it all up quickly in order to review them all straight away. Lush Bath time, to me, is a luxury, therefore i don't throw in a £3 bath bomb every night. haha. If i had the money though, trust me, i so would. I've repurchased these over and over. I'm seriously going to have to stock up..or protest to have them made permanently. They aren't as big as the normal melts, but these little beauties are not my favourite because of the smell (even though it's Snow Fairy scented..and smells delicious) I was told by the Lush girl they are actually made up of 90% icing sugar (or around that - If she is wrong..then shame on her) and so when used in the bath, it turns a very milky consistency & leaves your skin feeling SO moisturised and soft..and the smell ACTUALLY lingers on your skin. 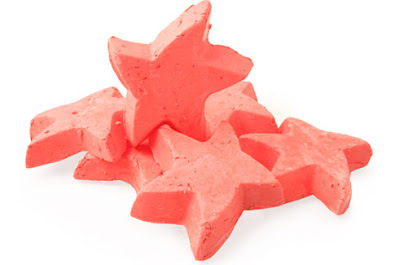 I found that you don't need to use the whole star for your bath, but if you have a large tub, or are feeling particularly indulgent, using the whole thing is FAB. The scent is alot stronger though obviously. If you're not a fan of sweet smells, i wouldn't get this..actually..scrap that, just sit their with a peg on your nose because its worth it for how you feel afterwards. These are £2.45 which, i'd say is pretty average for a lush bath item, and the price doesnt effect me too much tbh. I'd buy these if they were £4. They do alot more than any bath ballistic has ever done for me, so i'm a happy bunny.